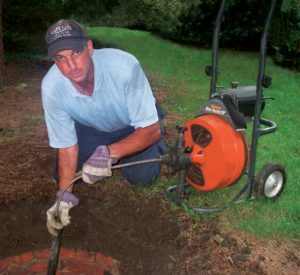 That’s Jeff Wall on the Mini-Rooter XP®, his favorite drain cleaning machine. Easy to transport and maintain, Mini-Rooter XP from General Pipe Cleaners unclogs drains from rooftop to basement, including kitchen, bath and laundry lines. It carries 75 ft. of 3/8″ or 1/2” Flexicore® cable to clear 2”, 3” and most 4” drain lines. General’s practical design makes drum and cable switching a snap – with minimal mess or lost time. The variable speed Power Cable Feed drives and retrieves the cable at up to 16 ft. per minute for optimum cable control. 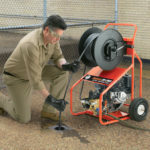 Mini-Rooter XP rides on 8” semi-pneumatic wheels. The solid, easy-grip handle folds down to save space, and locks in place as an extra lifting handle. The compact design even lets Wall store it in his pumper truck. A roll bar protects the 1/3 hp motor during transport and operation. Standard safety features include an air foot pedal and ground fault circuit interrupter. An optional J-Drum for smaller drain lines is also available. 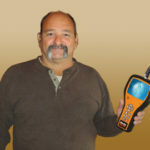 A drain cleaning professional for over 30 years, Massachusetts-based Jeff Wall owns Wall Septic & Drain Cleaning Co. He also likes to push his equipment to the limit. Wall equally credits his machine’s rugged, root cutting performance to Flexicore cable from General. That’s because Flexicore cable is made of heavy-duty wire coiled tightly around 49 strand aircraft-type wire rope. General’s unique design features unequaled strength and the right amount of flexibility. And it’s so tough it carries a one-year warranty against defect or breakage. 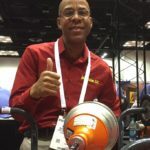 Jeff Wall loves the peace-of-mind that rugged, reliable equipment affords. For more information, contact the Drain Brains® at General Pipe Cleaners at 800-245-6200, or visit www.drainbrain.com/XP.